Designed to optimize mental function and physical performance, Nootrobox seems to be the perfect way to open up the market for a whole new generation of dietary supplements. But with a proposal of $2 million for 5% equity, will the sharks buy into the seemingly miraculous Nootrobox, or will they pass on this opportunity? Geoffrey Woo and Michael Brandt are two young entrepreneurs from San Francisco and the CEOs of Nootrobox. The company is armed with a team of biohackers, researchers, and technologists, who focus on the development and marketing of nootropic supplements. But what exactly are nootropics? These are drugs long used in worldwide pharmacology who improve cognitive function, that is, they lead to quicker and more efficient “brain power”. Nootropics are a rapidly growing market nowadays, and Nootrobox is on the forefront of bringing these drugs into the market in a way that is accessible to everyone. Set in Silicon Valley, the two entrepreneurs are surrounded daily by some of the most creative and ambitious people in the entire world, who are constantly trying to make the best out of each day, always staying one step ahead of the competition. The company relies on biohacking, whose is completely based on experimentation and controlling of inputs into the human body, taking into the account that, although the human body is a complex and intricate system, it’s still understandable as a computer system. Taking into account the company’s goal, and biohacking, Woo and Brandt first looked at something almost all Americans put into their body on a daily basis: a cup of coffee. In a search to re-engineer the classical cup of coffee for something that will lead to significantly better performance, thus creating Nootrobox: chewable coffee cubes. It’s convenient, portable, and has a very precise dose of caffeine and other nootropics, so you are guaranteed to get the kick of coffee in a much more balanced and controlled way. The product is available in three different flavors, ranging from latte, which is the lightest coloured cube, drip coffee, the medium coloured cube, and finally mocha the darkest coloured cube. In addition, each cube contains 50 milligrams of caffeine, the equivalent of half a cup of regular coffee, and 6 grams of sugar. Once Mark noticed how much the two entrepreneurs were focusing on the precision in caffeine per cube, he mentioned that Nootrobox is not the first dietary supplement that has a defined amount of caffeine in it. Although Woo seemed taken back by the comment, Brandt ended up explaining that it’s a common practice amongst biohackers to fast intermittently on a weekly basis, meaning that for 36 hours straight they consume zero calories because, according to them, caloric restriction is one of the most compelling ways to keep longevity. This seemed quite a dubious fact, but the sharks decided not to make any comments on the statement. On the other hand, Robert was more interested in knowing why the company has a valuation of $40 million. Brandt explained that, although the company was only founded in 2014, it has done to date almost a million in revenue and are consistently getting a revenue growth of 17% per month. After Chris enquired them if they were actually scientists, it became clear that the two entrepreneurs are computer scientists. Now it was time for the Nootrobox CEOs to further explain what exactly is the product. Woo further explained that there’s an amino acid in green tea called L-theanine, which when combined with caffeine reduces simple reaction time by fifty percent, and increases semantic memory. With several trials backing up this statement, Nootrobox relies on the combination of these two core ingredients. It came down to Woo explaining that Nootrobox is actively seeking ways to improve your cognition more efficiently than just your ordinary cup of coffee, claiming the company is at the forefront of doing research and actually figuring out what these products are. Kevin was the first shark to drop out of the deal, claiming that the valuation was too high and, although maybe one day the company will reach that net worth, it won’t be due to Kevin’s investment. Robert was the second shark to mention the valuation which was the highest seen on the show. Perhaps due to oblivion, Brandt went on to explain that, just like Apple, the investment in Nootrobox is based not on sales, but on the technology employed and the marketing strategy. As Lori expertly put it “You’re not Apple, you came in and gave us sugar cubes.” The future wasn’t looking too bright for the two entrepreneurs at this point. Brandt kept on defending the product, claiming that it could replace coffee as an everyday performance enhancer. Robert backed out of the deal after hearing this, claiming that although he believes the two entrepreneurs are quite smart, that the valuation was not well explained and therefore he wasn’t even interested in investing. Chris was the third shark to share some entail. He clarified that, although he had used nootropics before, the next day he suffered from headaches and a lack of memory, which makes Chris worried about the long-term effects, and scared to invest in nootropics. Lori was the next shark to drop out of the race. Although the entrepreneurs seemed knowledgeable about the science behind the product, she believes they didn’t do a good job in explaining sales and marketing, and therefore was not comfortable in investing knowing there is no one on the team with a more sales-oriented focus. Mark dropped out right after Lori, once again mentioning the valuation was too high. With no shark left and no deal made, the two entrepreneurs left the show empty-handed. 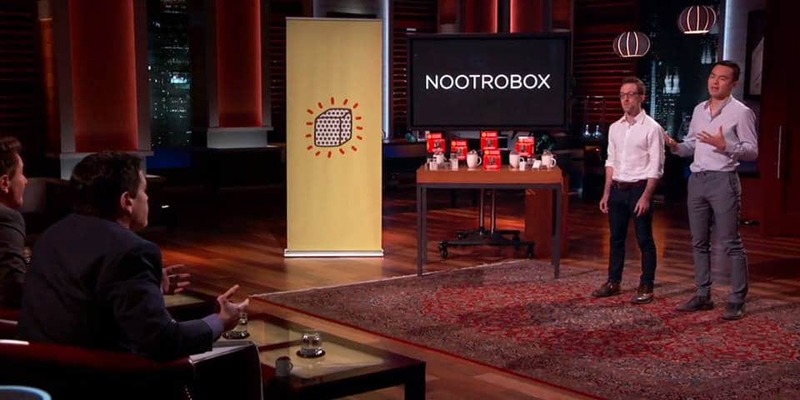 What happened to Nootrobox after Shark Tank? There are no further financial updates from Nootrobox since the show aired, although we are sure that the sales have grown since Shark Tank. We also noticed that the company has released a new line of nootropics, called Full Stack. If you would like to buy your own brain-enhancing supplement, don’t hesitate to check out their website nootrobox.com or buy the products online.